For one thing, the movie takes place immediately where the first film left off, so tonally it’s not trying to be something different than the original. The opening sequence features the Incredibles trying to stop the mole-villain Underminer (John Ratzenberger), who appeared at the end of the original film, and the plot develops from the fallout of that battle. In other words, these beloved characters are right where we left them, and in pristine condition. Writer and director Brad Bird’s patience waiting for the right story to emerge pays off. In some ways he’s arguably risk-averse, but there is a timelessness to the ‘60s-inspired world of “The Incredibles” — with its James Bond-inspired sets and music, vintage superhero motifs and “Johnny Quest” TV vibe — that simply getting more time in this world suffices. Nothing feels out of place, though there are some thematic connection to today’s zeitgeist. One example is the challenging of gender roles — the premise of “Incredibles 2” sees matriarch Elastigirl (Holly Hunter) getting a “super” job opportunity that keeps Bob/Mr. 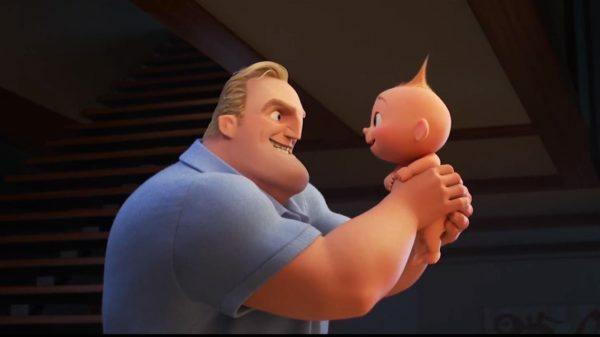 Incredible (Craig T. Nelson) home with the the kids: moody teen Violet (Sarah Vowell), hyperactive Dash (Huck Milner) and most complicated of all, baby Jack-Jack (Eli Fucile), who’s discovering his superpowers most obliviously. Like any ‘60s father, he has ego about being the breadwinner, a sentiment that hasn’t exactly dissipated in the 21st century either. There’s also some commentary about screen usage, drawing a parallel to the advent of television’s golden age to today’s world of personal devices, but more importantly — and more to the focus of the movie — is the continuation of the theme of being super and whether to hide who you are and stay in the shadows. Through a couple new characters, the Deavor siblings (Bob Odenkirk and Catherine Keener) — whose motives remain perpetually in question — Helen is in a position fix the superhero P.R. problem. All this to stay that story is secondary to the entertainment experience of the movie. “Incredibles 2” continues to build on the original’s reputation as being the most entertaining of Pixar’s catalogue, by the purest definition of entertainment at least. Rather than move you to tears as so many of their movies do, “Incredibles 2” gets the adrenaline going. Bird conducts engaging action sequences with tons of clever elements, culminating in a viewing experience that merges the fun of classic cartoons with ‘60s spy flicks. The movie’s most brilliant sequence, which sees Jack-Jack battling a raccoon, could’ve been a Looney Tunes sketch. In the scope of modern animated family films, “Incredibles 2” feels more in line with what Illumination Entertainment is doing with the “Despicable Me” franchise than the rest of Pixar’s movies, but Pixar brings a more thoughtful storytelling that Illumination isn’t as interested in. The attention to character shines through again, adding substance to a visually dazzling, endlessly fun movie that seamlessly continues the story of a beloved early-Pixar favorite.